Covington, VA (Feb. 8, 2019) - The Alleghany Highlands Chamber of Commerce & Tourism will be hosting 3 Familiarization (or “FAM”) Tours of the Alleghany Highlands this year. 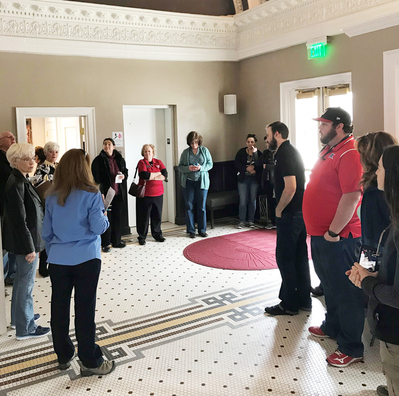 The dates are: Monday, March 18, Monday, April 29 & Monday, May 20 from 8:30 a.m. to 4:30 p.m. Local tourism-related businesses have been invited to participate in one of the tours by sending a staff member to be a tourist for a day. These tours will take participants to local attractions, allowing them to experience firsthand what there is to see and do here in the region. A continental breakfast and lunch will be included as part of the day. The Chamber is providing this tour free of charge to local tourism-related businesses (motels, restaurants, service stations, attractions, etc.). Space is limited, however, so you will need to register by calling the Chamber at 540-962-2178. Deadline to register is Wednesday, March 13th for the March, 18th tour, Wednesday, April 24th for the April 29th tour & Wednesday, May 15th for the May 20th tour.